Fig. 8-10. Runner looped around a rock horn: a, a dangerous rappel anchor; b, runner rides up and off rock horn. than low on the trunk, it helps limit the rope's contact with the ground, making it easier to retrieve the rope and reducing rope abrasion and the risk of rockfall. But note that connecting to a branch rather than the trunk puts more leverage on the tree, increasing the danger that it could be pulled out. Be cautious in using bushes as an anchor, and if you do use one you'll probably want an additional anchor or two for safety. Also be careful using trees and bushes in very cold weather, when they can become brittle. Rock features—horns, columns, chockstones, large boulders—are commonly used as anchors. On snow or ice, you can make bollards (see Chapter 12 for illustrations of snow bollards). Test a natural anchor if there's any question about whether it can support the weight of the heaviest climber, plus a large safety margin in case a rappeller puts extra force on the anchor by stopping quickly. You can test rock horns and smaller trees by pushing against them with your foot. Test the anchor before rappel gear is attached, and never after the rope or the rappeller is hooked in. If you run the rappel rope through a runner looped around a rock horn (fig. 8-10a), be rigorous in determining the angle of force on the horn. You must eliminate the deadly possibility the runner could ride up and off the hom during a rappel (fig. 8-10b). Most climbers use only a single anchor if it's a solid, dependable natural anchor—but add another anchor or two if there are any doubts. As a rule of thumb, if you are using artificial (manufactured) anchors, use at least two and try to equalize the load between them. 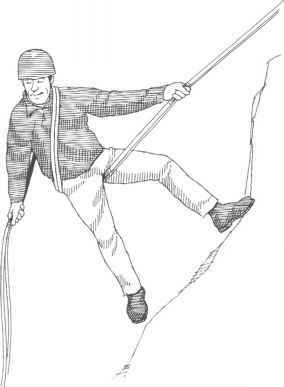 In unknown alpine terrain, some climbers carry pitons and a hammer to set anchors. The most common artificial rappel anchors are bolts or pi-tons that have been left in place by previous climb ers, and which must be evaluated for safety just as if you were using them for belaying or for protection while climbing. The climbers' hardware known as chocks— nuts, hexes, and so forth—are usually used only if no good alternative is available, but better a couple of good chocks than a shaky rock hom. It's not a good idea to trust chocks that you find already in place, left behind by climbers who weren't able to work them loose from their crack in the rock. However, sometimes you can take advantage of an abandoned chock by using it like a natural chock-stone—looping a runner directly around it and making no use whatsoever of the sling attached to the old chock. 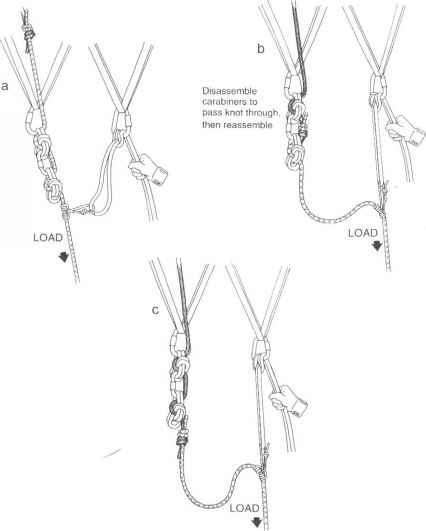 How to rappel off natural anchors? 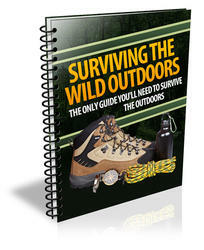 Can a rappelling rope be looped around a tree?